As summer kicks off, it’s time for a vacation. But between you and the open air lies a whole slew of social tasks that need completing—most especially, questions from your customers. 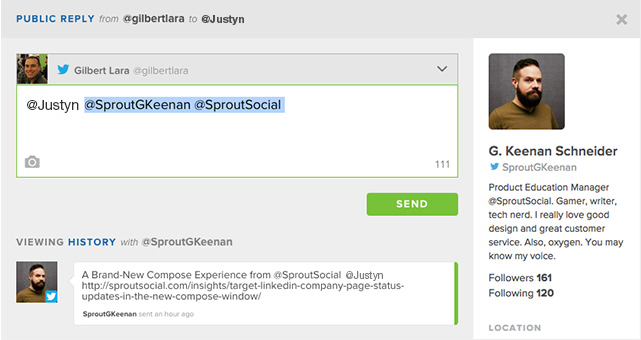 To help you address their needs (and get out the door) faster, here are five ways to use Sprout Social’s Smart Inbox for improved workload efficiency. If you are replying all to a Tweet, there’s no need to remember all the handles mentioned. 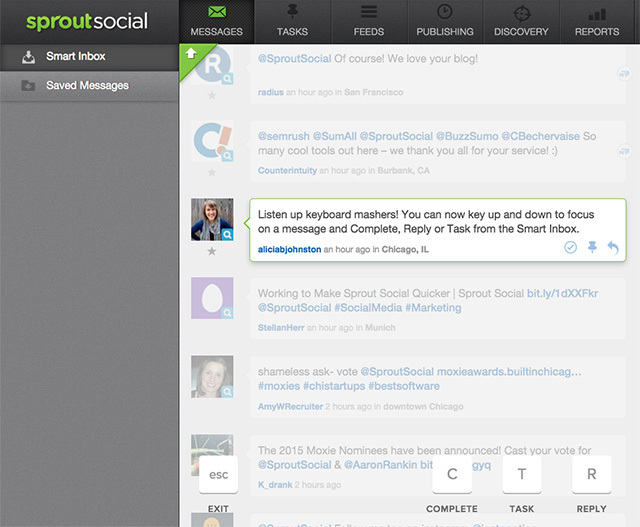 Just click R, and the handles will populate automatically in the reply box. Use the backspace to delete any handles that you don’t want to receive your reply. Tune out the noise. 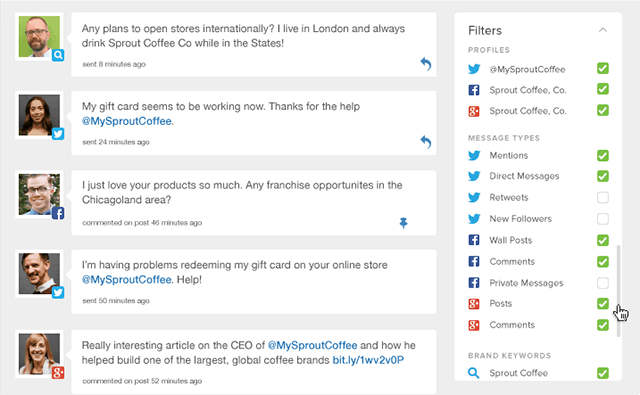 Use the Smart Inbox navigation menu to filter specific profiles, networks, message types or keywords. Then, work through messages to clear out the inbox. Work even smarter by clicking on words instead of the checkbox to turn off everything else and show only messages from that filter. Use the Smart Inbox bar chart to see what messages are still left. Select a time frame, then scroll over on the corresponding bar to see how many messages have not been marked as complete. Click on any bar to go to a stream of those messages. As you mark messages as complete, the chart updates to reflect what’s remaining. Messages stream into the Smart Inbox all day across all networks. Use the Mark as Complete function to clear out messages you have already responded to or that don’t require a response. Coupled with the Hide Completed Items checkbox, messages that have been completed are removed from the inbox so you can focus on the next thing that needs your attention. If the concept of completed items and blue progress bars on your inbox chart from tips 4 and 5 doesn’t look familiar, don’t fret. These features, along with the ability to mark messages as complete, are controlled by the Manage Message Status permission. This permission can be set under Users & Social Profiles but only by account owners or managers who can invite other users. If you don’t have this permission but think it will improve your productivity in the Smart Inbox, talk to your account owner about getting it turned on. Have any other tips or tricks that help you stay productive in the Smart Inbox? Tweet us or share your ideas below.